Jack Nicholson lets it all hang out in "About Schmidt," the tale of a retired man facing up to his mediocre life which the actor calls the most miserable role of his life. Directed by independent film maker Alexander Payne, the tragi-comedy is battling for the coveted Palme d'Or at the Cannes film festival, where the movie this week earned rave reviews. Also screening Wednesday was Aki Kaurismaki's retro-look "The Man Without a Past," which the Finnish director described as an antidote to the hopelessness of life. "About Schmidt" is the last of three U.S. entries to screen in the main competition at Cannes this year all to a warm reception. Michael Moore's "Bowling for Columbine" and Paul Thomas Anderson's "Punch-Drunk Love" premiered earlier in the festival. Nicholson turns in a bravura performance as Warren Schmidt, who sets out for a road trip in his 35-foot motor home in order to make sense of his life after the sudden death of his wife. Key to it was Nicholson's willingness to flout Hollywood convention by playing a character who is both physically and morally unattractive. "I couldn't look at myself in the mirror the whole three months I was doing this picture because I thought I would never return to myself," the actor said Wednesday. Schmidt is a fat, balding man with a comb-over. Payne, known for stripping his actors of all artifice, did the 65-year-old Nicholson no favors. 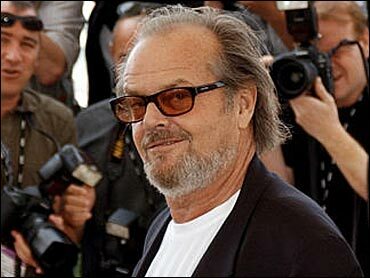 "This is the least vain performance I think I've ever given," Nicholson said. Schmidt, recently retired from his job as an actuary at an insurance firm, falls apart when his wife dies. He sets off for Denver, where his daughter is about to marry an under-achieving waterbed salesman. He shares his journey of self-discovery in unintentionally comic letters to a six-year-old Tanzanian orphan he sponsors through a charity. "He's a miserable man to inhabit, worse than any drama I've ever done," Nicholson said. "You don't get the joke when you're playing the character, you just have to be that guy, so it was trying in that way." Payne, who won critical acclaim with his student politics drama "Election," said working with one of the sacred monsters of the industry was less daunting than it sounded. "He made it very easy," the director told a news conference. "He was willing and able to do anything that the film required." Kaurismaki drew warm applause for "The Man Without a Past," the story of a man who loses his memory after he is savagely beaten up shortly after his arrival in Helsinki. Still amnesiac, he finds love with a volunteer at the Salvation Army who helps him to rediscover his humanity. The movie, populated by eccentric characters, reflects Kaurismaki's love of the 1950s. Music of the era permeates the film, which features several musical interludes, while artificial lighting gives objects a bright glow. The quirky filmmaker said he had wanted to create a homage to Frank Capra's classic "It's a Wonderful Life." "Since there is no hope left in the world, I tried to make a hopeful film without too much pessimism, because everything is kind of wrong nowadays," he said.